* This quill was produced as a cost alternative to the traditional German quills. * The erosion of the dollar versus the euro has inflated the price of our quills in the last few years. * We decided it was time to produce an American made nickel plated ferrule quill to give the painter another cost conscious choice. 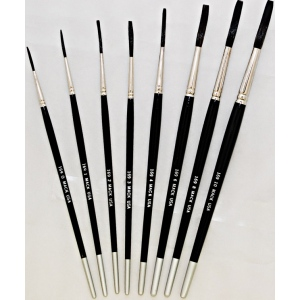 * The traditional quill will always have a place in the sign painter's kit. * We have been having tremendous success with the Bobbo Super Quad brush hair so we decided to put that in this quill. * The hair that is used is a black synthetic and blue squirrel mixture as opposed to the German quill that is made of pure squirrel hair. * The quill has been put through the paces by several sign painters and the reviews have been outstanding. * We offer this quill in the following sizes; 0, 1, 2, 3, 4, 6, 8, and 10.